In all seriousness, I've noticed that none of the split piles have gotten any love, so what better place to start than one of the (arguably) most niche ones? The Settlers/Bustling Village split pile is a strange set of cards. To a new player, they seem strong, albeit a little gimmicky. However, once a player gains experience in how a good dominion engine should be built, it's easy to regard the pile as antithetical to a consistent engine, and therefore not worthwhile. While it's true that the Settlers/Bustling Village pile is highly situational, and quite often a waste of resources to go for, that is not to say that the pile never has its uses. 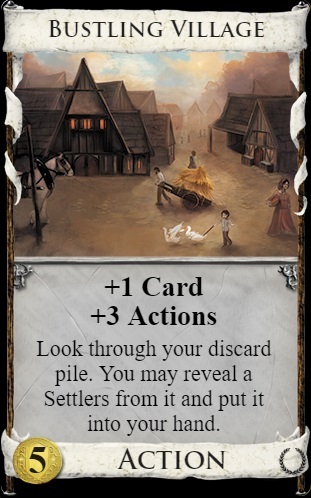 In the presence of the right cards (or more importantly when certain cards are absent), running down the Settlers/Bustling Village pile can be the key to creating a consistent, powerful engine in kingdoms that could otherwise not sustain one. To understand the S/BV pile's inherent failings in an engine (and how to work around them), one must simply evaluate the card at face value. First, Settlers: on its own, it's a useless cantrip. 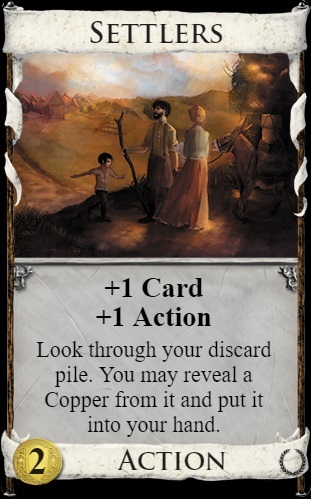 With a copper in your discard pile, it becomes a pseudo-vanilla money cantrip - going off of Poacher's value as $4 with a downside, an activated Settlers is, at first glance, a $4.5 card bought at $2. Not bad, right? Then there's Bustling Village: on its own, +1 card,+3 actions, the same effect of playing two vanilla villages consecutively. Useful, but a little weak for a 5 cost. If Bustling Village picks up a Settlers, it becomes +2 cards, +3 actions - an even stronger variant of Lost City, which itself is a major power card for engines. If the subsequent Settlers picks up a Cooper, then you have +2 cards, +3 actions, +$1, which appears utterly absurd for a mere 5 cost card. In a vacuum, these cards seem perfectly strong, albeit unreliable, but simply buying out the pile brainlessly comes with 3 fatal flaws. 1) To maximize the potential of the pile, you need to keep Coppers in your deck. One of the first major lessons of building a good engine to remove your Coppers and Estates as quickly as you can, without irreparably harming your economy. However, once you remove your Coppers, you also remove Settlers' only potential benefit to your deck, rendering it a useless cantrip. While useless cantrips can still have benefits in edge cases (City Quarter fuel, Enchantress fodder, Vassal/Herald targets, etc. ), spending money and buys on a card that will almost never help you is a severe opportunity cost, and usually a waste of time. 2) The S/BV pile only reaches its full potential off a filled discard pile. This means that when playing with a thin or empty discard pile, your deck will be noticeably weakened, and more than likely play far less effectively than any other engine. Sure, when you draw all your Bustling villages with a discard pile full of Settlers, your engine will work fantastically, but that's hardly something you can rely on happening consistently, and maximizing consistency is one of the most important parts to engine building. Your Bustling Village engine will work really well sometimes, but you're far better off to have an engine that works all the time. 3) An optimal engine will draw most or all of your deck. Therefore, an optimal engine will be played with an empty discard pile 80-100% of the time. Therefore, if your engine is working as it should be, you will almost never be able to reap the benefits of the S/BV pile. And if your discard pile is usually full...well, you either built your engine wrong, or are you're in a slog-type junker game in which building a coherent engine was near impossible anyway. So, knowing these 3 weaknesses, why would this be a pile you'd ever want to go for? There are two possible answers to this question, so let's start with the simpler one. I really need the +3 actions! On boards with incredibly strong terminals and no other villages, it can sometimes seem tempting to drain the Settler pile just to get those all-important +3 actions, discard pile benefits be damned. While this is certainly a viable reason to drain the pile, be very careful when going for this. In order to get to the Bustling Village pile, you first need to spend $10 and 5 buys on cards that, for the most part, will rarely help your deck. While you spend your buys and economy on the Settler pile, your opponent can happily spend the time simply building up their own economy in anticipation. If you're not prepared, your opponent can simply buy out the Bustling Villages with his superior deck once you've revealed them, giving them free reign of the terminals and leaving you with an incredibly lackluster deck. Because of this, never go for the S/BV pile without the ability to gain settlers both quickly and with minimal expense to your deck quality. Multiple buys are the easiest solution to this, though Talisman and Ironworks can both act as stackable gainers that don't rely on multiple actions to work. Even then, make sure to intersperse your Settler purchases with economy building - once the Settlers are all gone, you need to hit $5 as consistently as possible (maybe even $10 with two buys). 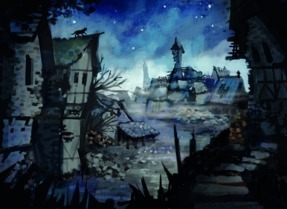 There's only 5 Bustling Villages, after all - getting at least 2 or 3 of them should be your highest priority. While rare, there are occasionally sets with an S/BV pile and no trashing, and it's these situations in which the S/BV pile truly shines. This may seem confusing at first - even with Coppers in your deck, the second and third flaws with the S/BV pile should be as prevalent as ever, right? There's no way you can't base your deck around an unreliable money cantrip! Well, while basing a strategy around Settlers' "economy" is a fruitless activity, it's important to remember that an activated Settlers is not just +$1, but rather...a handsize expander! ...A handsize expander for junk cards that won't run an engine, you mean. Who cares if you put a bunch of coppers in your hand? Sifters care. In fact, with good sifters, problems 2 and 3 of the S/BV pile are eliminated. Who cares if your discard pile is empty when you can just put Coppers in there yourself? So you discard your Coppers, then pick them back up again? How is this useful, exactly? Well, to elaborate, let me give you an example. You play Warehouse, drawing a Copper, and Estate, and another Warehouse. You discard both Coppers and the Estate. Your hand is now X, Settlers, Settlers, Warehouse. After playing both Settlers, you draw X, Bustling Village, and take the Coppers out of your discard pile. Your hand is now X, X, Bustling Village, Copper, Copper, Warehouse. You play Warehouse again, drawing Settlers, X, and X. You discard the Settlers and both Coppers, leaving you with X, X, X, X, Bustling Village. Bustling Village picks your Settler back up, which in turn returns your Copper. Assuming both your Bustling Village and Settler hit cards you want, your new hand is X, X, X, X, X, X, Copper. Despite having a deck filled with junk, you now have a hand of 6 powerful cards, along with 3 actions to play them! In a regular scenario, playing two Warehouses would have left you with a hand of 3 strong actions at best. In this regard, Settlers offsets the main drawback of sifters - their handsize decreasing effect - by letting you recycle your junk to be re-sifted for as long as you have Settlers and Bustling Villages out of play! Even sifters that don't decrease handsize benefit massively from this, as your sifters can still recycle your Coppers, and thus will increase your handsize dramatically even before using +Card terminals. The strongest example of this by far is Stables. Repeatedly discarding and picking up Coppers will allow you to repeatedly trigger Stables' +3 cards/+1 action effect without consequence, allowing you to consistently draw your whole deck, while also picking up multiple Stables with no potential penalty to your economy. While this strategy is always possible with the S/BV pile and a sifter, don't try this strategy if there is actual trashing in the kingdom. While re-sifting Coppers can allow an engine to run very effectively, it's infinitely easier and more cost-efficient just to buy one or two trashers, then remove your Coppers and Estates from your deck entirely. And if there's no trashing or sifting...well, consult problems 2 and 3, and don't invest heavily in Settlers. What about boards with trashing and villages? Well, the S/BV pile will hardly be a power card in these sets, but it will almost never be a pile to stay away from. As a cantrip, Settlers can't necessarily hurt your deck, so if you hit $2 and don't have anything better to grab, there's no shame in picking one up. If nothing else, a Settlers and a little bit of luck can definitely be a nice boost in the early game, letting you pick up Coppers from the discard pile as a temporary economy boost or just for more efficient trashing. In 3 or 4 player games, sometimes the Settlers pile will simply run down passively, if every player picks up 1 or 2 copies on a dud turn. In this case, it's best to treat Bustling village as a somewhat value-for-money village purchase, and a nice pickup if your deck is heavy on terminals. And occasionally, such as in the situations mentioned earlier in the article, having a couple cheap cantrips can definitely help with an engine's coherency Unless you're talking about Rats, Dominion is rarely an all-or-nothing game - if you think a Settlers or Bustling Village will be handy and have the buy/economy to spare, you might as well grab a couple. Overall, the S/BV pile is an outlier for understanding Dominion boards. Unlike most situational power cards, which require specific combinations of cards to be worthwhile, the S/BV pile (quite thematically) thrives off of Kingdoms in which basic engine pieces - villages and trashers - aren't there. Because of this, understanding both when and how to drain the S/BV pile, and when to ignore it entirely, will make and break the games in which this pile is present. You should find and replace "Border Village" with "Bustling Village". I find that in some games with copper trashing, you still use Settlers to pick up copper early on. And then later you get Bustling Village and you don't mind that you ran out of coppers, because putting Settlers into hand from discard is already good enough. Ah, heck. Didn’t realize my affinity for Hinterlands ran that deep into my subconscious. Thanks for the heads up! As for your point about Settlers, I partially agree. You’re right that settlers still has use in the very early game, before you’ve trashed everything. If nothing else, if you hit $2 in your buy phase, Settlers will almost never outright hurt your deck. My main concern is that it’s far from guaranteed for the Settler pile to always ‘become’ Border Bustling Villages. Maybe your opponent(s) never hit 2, or maybe there’s more appealing uses for $2 on the board...heck, maybe they’re running BM+draw engine and legitimately don’t want Settlers. In many cases, you kinda need to invest in Settlers if you want to see Bustling Villages at all. As for your second point, while drawing your Settlers with Bustling Village is great, it’s super unreliable imo. You’re both banking on drawing your Settlers first, then your Bustling Villages on a later turn, while also banking on not drawing through your deck quickly so that you actually have a Settler-filled discard pile to work with. I find these two combination of factors to be unreliable enough that I rarely get a natural Settler discard pickup more than 3 times a game. Not to mention that you should be aiming to draw your entire deck anyway (thus never having a discard pile), if you’re able to trash all your junk. That being said, your points are definitely valid. I just personally like using the split pile differently. Odd to call Forum out as a synergy, but not Stables. I feel that the article could emphasis more on the fact that Settlers/Bustling Village isn't a pile that you go for hard, but rather one where you're usually happy to pick one up if you have nothing better to do. Which is roughly what trivialknot said I guess. Back when I created Settlers as a stand-alone pile, picking up discarded Coppers was definitely the main focus. It's especially nice with Stables, and it also had some combos with other cards in my fan set. Having only 5 copies of it available limits the amount you get to see these interactions, but I do like how it works with Bustling Village. I always enjoy these combos when they're available. Huh...I can't believe I didn't see that. I've played with Stables and the S/BV pile before, but never played with them together/connected the dots in that regard. Welp, that's definitely something I have to fix. As for your second point, I definitely agree with you. In games where that pile isn't super necessary, it's definitely a pile where you pick one up when you can. Writing about that just felt...I dunno, redundant? I mean, it's like writing an article for Pawn - people generally know what they're doing with it, and nobody's gonna be surprised to hear you pick those up when you have a spare $2 lying around. I mostly wanted to try and write this article to cover the edge cases in which the pile is actually an important presence, rather than a consolation prize. That being said, you're right that I should at least try to mention that aspect of the pile. I'll add an addendum to my article as soon as I can. Interesting article, if only for putting into coherent words why I've always found that pile a little lacklustre. A couple of minor points: I'm not sure it's realistic to compare BV drawing Settlers so favourably cost-wise with Lost City. BV-drawing-Settlers doesn't cost $5; it costs $7, two buys and an extra card in your deck. Also, in considering the value for money of a BV that's not drawing Settlers, it may be worth comparing with Port, which achieves the same effect for $4 plus an extra card in deck (which may actually be a good thing, since either copy could suffice to get your engine started). Does 'Strong sifters' include discarders -- Young Witch, Oasis, Poacher etc.? Artificer is especially neat with Settlers, even in the absence of all other synergies you mention. A hand of Artificer-Settlers-Copper-Copper-Estate, with no Coppers in discard pile, effectively makes 2 Laboratories out of your Settlers and the other you gain. I find that a decision on how to compete with an opponent for these cards is quite difficult. Quite often, having a minority of settlers or minority of bustling villages doesn't seem fatal, especially if you've been buying other good cards instead. I'm going to suggest. without any proof, that an efficient deck construction would have a similar number of coppers, settlers, and bustling villagers. Having more of one type of card will increase draws but not by so much. Does anyone have any views or stats on that? It's a good way to make sure your Moneylender connects with a Copper. Same goes for Junk Dealer, Spice Merchant, Bats, and anything where you need something crappy in your hand to trash. Dungeon may deserve a honorable mention, as I think it's the best sifter for Settlers/Bustling Village. First you can discard 2/6, then 2/7, and Dungeon staying out during the reshuffle can prevent Settlers/Bustling Village from being mere cantrips/villages on your first turn after your reshuffle. It not being terminal also helps. Cellar/Minion/Storeroom can technically choose from more cards to discard in a single play, but require a lot of draw to do so. Also it doesn't work with 'put your deck in your discard pile'-cards, because both of them draw before pulling something from discard, so don't accidentally try that. Exception: Scavenger helpfully topdecks one card. It’s true that you can only get one Settlers/BV to draw after a Scavenger play, though. Both of these like discard-for-benefit, or even discard-as-penalty. Anything that can discard Coppers from your hand or deck go well with Settlers, provided you don't draw your *entire* deck. Royal Blacksmith is tricky, as it draws a LOT.